The posts over the last several weeks have generally all been focused on the cross of Christ (and rightly so), namely His atoning death and the penalty He took which was due to sinners. The reason for this focus was that I became aware some months ago that my knowledge of the cross was shamefully lacking. This isn’t to say that I now have it all figured out, but to simply highlight the importance of knowing what the Bible has to say concerning Christ’s death. Since it is central to the Christian faith, I want to encourage you to likewise study deeply on the cross of Jesus because it magnifies the character of God, it amplifies the love that He has for His children, and it puts on display who Jesus is and how truly amazing it is that He would die for sinners. In the first post of this series we examined the meaning of Atonement first from several helpful definitions and then from a biblical perspective, primarily through Leviticus 16, where we saw the high priest Aaron was instructed to perform specific duties as God outlined the Day of Atonement (Yom Kippur) to Moses. Recall in that passage that the practices on this day were to be repeated every year. In addition to the daily sacrifices made by priests, this day was set aside as a holy day of rest or Sabbath (Leviticus 23:26-32). As we read through the passage from Leviticus, three important duties were defined for Aaron: 1) He was to sacrifice a bull as a sin offering for himself and his household 2) He was to sacrifice a goat as a sin offering for the people of Israel 3) He was to “transfer” the sin of the people onto a “scapegoat” that would then take the sins of the people outside the camp and into the wilderness. These high priestly duties were taken very seriously and it was with great fear, reverence, and deliberation that they were performed exactly as instructed. Now, as promised we need to look at how this relates to Jesus, specifically His atonement which we will include as part of His “work” on the cross. First, let’s note in this passage, as well as the one above it from Hebrews 2:17, that we read of Jesus’ humanity in His role as High Priest, “made like His brothers in every respect” which means made into human likeness. Likewise we read of the impeccability of Jesus’ human nature, “For we do not have a high priest who is unable to sympathize with our weaknesses, but one who in every respect has been tempted as we are, yet without sin.” Why is it significant that Jesus should be fully man and that His sinless humanity should be so emphasized? Note Hebrews 4:16, “For every high priest chosen from among men is appointed to act on behalf of men in relation to God”. The high priest was chosen from among men to act on behalf of men. This is important because Christ fulfills the role of High Priest as a man interceding for men, therefore giving great significance to the biblical truth of the necessity for Jesus, the Son of God, to be fully man. Next, we need to look at the other sacrifices made by the high priests, namely the two goats. Remember, the first one was killed and its blood sprinkled on the mercy seat for the forgiveness of the Israelites sins (Leviticus 16:15-16). 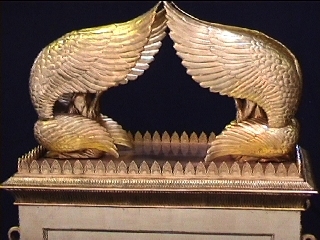 The mercy seat, as we learned in part 1, covered the Ark of the Covenant, which contained the Law (think 10 Commandments). How then does this relate to Jesus’ role as High Priest? As High Priest, the sacrifice that Jesus made was Himself. It was His own blood, poured out “on the mercy seat”, as it were, that made propitiation for the sins of His people. Think about this, the blood of Jesus was able to procure mercy for His people because it satisfied the justice of God, namely His wrath towards ungodliness. “Without the shedding of blood there is no forgiveness of sins.” Hebrews 9:22 This passage highlights the necessity of bloodshed required for the forgiveness of sin, therefore Christ’s death was a necessary requirement. “For it is impossible for the blood of bulls and goats to take away sins.” Hebrews 10:4 Here we see that the blood from the animal sacrifices of old were insufficient for the actual removal of sin. Jesus’ death was infinitely superior and sufficient. “For if the blood of goats and bulls, and the sprinkling of defiled persons with the ashes of a heifer, sanctify for the purification of the flesh, 14 how much more will the blood of Christ, who through the eternal Spirit offered himself without blemish to God, purify our conscience from dead works to serve the living God.” Hebrews 9:13-14 Now the transition from the imperfect, insufficient Old Testament animal sacrifices to the all-sufficient sacrifice of our Lord Jesus Christ. Through His sacrificial and willing bloodshed, Jesus Christ was a propitiation, literally appeasing the wrath of God that was bent towards sinners (John 3:36, Romans 5:1, 5:9-10, Ephesians 2:3). Let there be no misunderstanding here, God the Father and God the Son were not at odds with one another, thereby a loving Son placating the wrath of an angry Father. No, look at what the passage above from Romans says, “Whom God put forward”. It was the work of a loving Father (John 3:16), in concert with the love and willingness of the Son to satisfy the legal demands held against sinners. (Colossians 2:14) In doing this, God the Father propitiated or satisfied His own wrath, through the propitiation He provided, namely His Son Jesus. “Since, therefore, we have now been justified by his blood, much more shall we be saved by him from the wrath of God.” Romans 5:9 Lord willing the next post in this series will attempt to better explain the idea of propitiation. Continuing with our discussion of Jesus’ High Priestly role, remember that the Levitical high priest also placed his hands on the live goat, transferring the guilt and sin of the Israelites and then sending the “scapegoat” outside of the camp into the wilderness. This is the term expiation, the second part of propitiation which we just looked at. It too was accomplished through the substitutionary atonement of Jesus as He removed the guilt from His people. Like the goat of Leviticus, the sins of those who place their faith in Jesus have been “imputed” to Him and have been removed “into the wilderness” or as Psalm 103:12 states, “as far as the east is from the west, so far does he remove our transgressions from us” never to return again. There is SO much more that could be said about Jesus’ role as High Priest (for more, read from Hebrews chapters 5-10). The biblical truth is that Jesus fulfills the office of High Priest and that it is He that mediates the New Covenant between God and man, “…there is one mediator between God and men, the man Christ Jesus” (1 Timothy 2:5). This should serve as a stark warning to those religions or movements that feel man needs an earthly priest to make intercession (or confession to) or that somehow the virgin Mary serves as intercessor. An assumption that an earthly priest is necessary is a direct assault on the sufficiency of Christ’s completed work as High Priest. Dear friends, it is Christ alone. He is the only one who can intercede and He alone is sufficient to fulfill that duty. As High Priest, Jesus not only made the necessary sacrifice, but gave Himself as that sacrifice. Being fully God and fully man, He was the only one that could make that sacrifice. The awesome love that God displayed on the cross in giving His own Son as a propitiation, to appease His own wrath, should be enough to make you bow down and worship. If you are an unbeliever, we’ve only just scratched the surface of what God has done in Christ, yet unless you repent (turn from your sins) and trust in Christ, then you cannot experience it. Believers, look to God’s Word and examine all that He has done for you. Your response is to live your life in worship completely devoted to Him. Recently I finished a book written by Mark Dever and Michael Lawrence entitled, It is Well – Expositions on Substitutionary Atonement. This book peaked my interest because nearly a year ago I began to think deeply about what the Bible has to say regarding Christ’s accomplishments on the cross, namely the work of Christ. This interest came about as I wrestled with what many call the Doctrine of Limited Atonement, or perhaps more accurately described as Definite Atonement/Particular Redemption. Maybe you, like me, have always been taught a summarized version of what Jesus did on the cross, that He died for “our” sins and maybe even a common verse like Romans 5:8 or John 3:16 was used to express that idea. While these passages are absolutely true in their assertions, we must remember their context and realize that there is more to the story. To our discredit, many of us have developed what I call a “tract-theology”, sadly resulting in a truncated Gospel as well as a misunderstanding and misapplication of Scripture. Because of this, it seems to me that very few of us professing Christians are able to articulate the Gospel, much less talk intelligently about the cross of Christ, and I count myself among that number. Since it is the central tenet of our faith, it seems reasonable to me that we should all be aware, at least on an introductory level, of what the Bible has to say about this. When we biblically examine the nature, intent, and actuality of the work of Christ it magnifies God in our lives and opens up His glory to be put on display through us, essentially making Jesus a forethought instead of an afterthought. Perhaps one reason why so many professing Christians have been classified as “nominal” is because they lack knowledge concerning the foundation of their faith and have become too comfortable worshipping a small God who saves through an even smaller cross than the ones most wear around their neck. That being said, I’d like to devote several posts to these thoughts as we search through Scripture, to unfold the glorious nature of the cross. Instead of just hearing “Jesus died on the cross for our sins” a saying most of us have heard since childhood and are likely numb to, maybe if we actually took the time to understand what the Bible said it would not only humble us, but magnify the Lord in our lives. For today, let’s simply begin with the word Atonement. The Oxford English dictionary defines it as, “as the reconciliation of God and humankind through Jesus Christ.” In Wayne Grudem’s Systematic Theology, he prefers to define it as including the “life and death” of Jesus, which alludes to His obedience in life as well as on the cross. Sufficient for our discussion today will be the ESV Study Bible definition of, “The making of enemies into friends by averting the punishment that their sin would otherwise incur.” The Bible defines this punishment in a two-fold manner: 1) The wages of sin is death, primarily in an eternally spiritual sense (Romans 6:23), but also physical death as a consequence of the Fall. Genesis 2-3. 2) The wrath of God. The Bible makes clear that unrepentant sinners will suffer in Hell under God’s wrath for all eternity. (Romans 2:5, Revelation 6:10-11, 14:10). So there is something that Jesus did on the cross which provided an “atonement” or a turning away of the punishment, namely death and God’s wrath in hell for eternity, that somebody deserved. 1 The LORD spoke to Moses after(A) the death of the two sons of Aaron, when they drew near before the LORD and died, 2 and the LORD said to Moses, “Tell Aaron your brother not to come at any time into the Holy Place inside the veil, before the mercy seat that is on the ark, so that he may not die. For I will appear in the cloud over the mercy seat. 3 But in this way Aaron shall come into the Holy Place: with a bull from the herd for a sin offering and a ram for a burnt offering. 4 He shall put on the holy linen coat and shall have the linen undergarment on his body, and he shall tie the linen sash around his waist, and wear the linen turban; these are the holy garments. He shall bathe his body in water and then put them on. 5 And he shall take from the congregation of the people of Israel two male goats for a sin offering, and one ram for a burnt offering. 6 “Aaron shall offer the bull as a sin offering for himself and shall make atonement for himself and for his house. 7Then he shall take the two goats and set them before the LORD at the entrance of the tent of meeting. 8 And Aaron shall cast lots over the two goats, one lot for the LORD and the other lot for Azazel. 9 And Aaron shall present the goat on which the lot fell for the LORD and use it as a sin offering, 10 but the goat on which the lot fell for Azazel shall be presented alive before the LORD to make atonement over it, that it may be sent away into the wilderness to Azazel. 20 “And when he has made an end of atoning for the Holy Place and the tent of meeting and the altar, he shall present the live goat. 21 And Aaron shall lay both his hands on the head of the live goat, and confess over it all the iniquities of the people of Israel, and all their transgressions, all their sins. And he shall put them on the head of the goat and send it away into the wilderness by the hand of a man who is in readiness. 22 The goat shall bear all their iniquities on itself to a remote area, and he shall let the goat go free in the wilderness. If you’re like me, you may have either never read that passage before or never realized its significance, which is too often the case with Old Testament passages. Nevertheless, there is a ton of information packed into this chapter. First, let’s note that atonement shows up in verse 6, as Moses is instructed to tell the High Priest, Aaron (his brother) the very precise nature of his duties, beginning with the sacrifice of a bull for his own sins. Next Moses is to tell Aaron to cast lots over 2 goats, essentially flip a coin, resulting in one being the sin offering and the other for Azazel, an unusual Hebrew word that can be thought of best as referring to the “scapegoat”. The Oxford Dictionary defines this familiar term as, “a person who is blamed for the wrongdoings, mistakes, or faults of others, especially for reasons of expediency.” In short, Aaron has two goats, one for a sin sacrifice and the other to be released upon the “transfer of sin” to it as the “scapegoat”. Returning to our passage in Leviticus, we’ll next look at verses 20-22 as we see the fate of the second goat, which we’ve already identified as the “scapegoat”. Here Aaron is instructed to lay his hands on the live goat in order to transfer or “impute” the sins of the people of Israel onto it. Then the goat is sent off into the wilderness with the idea being that it has taken away the sins of the people to an area outside of the camp of Israel with the implication that it too will die. Summarizing the biblical historicity which we’ve looked at so far we see that the atonement contains several components. First, Aaron, the high priest, made atonement for himself and his house through the blood of a bull. Next, he made atonement for the people of Israel through the blood of a goat sprinkled on the mercy seat. Finally, we read of Aaron placing his hands on the scapegoat as a transfer or imputation of the sins of Israel onto the goat as it was lead outside of the camp into the wilderness. Lord willing, next time we’ll look at how all of this relates to Christ’s own atonement.